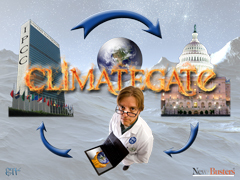 Has ClimateGate Changed Obama's Global Warming Strategy? Has the emerging international ClimateGate scandal changed President Obama's global warming strategy? After winning the Nobel Peace Prize last month, expectations were that Obama would not attend the United Nations Climate Change Conference in Copenhagen due to it conflicting with the Nobel awards ceremony in Oslo. This speculation was supported in the past couple of weeks when world leaders meeting in Singapore punted on reaching any firm agreements at the upcoming Copenhagen meeting, and Senate Majority Leader Harry Reid (R-Nev.) delayed action on cap-and-trade legislation until next spring. Yet, within days of the ClimateGate scandal breaking, Obama surprisingly announced that he's going to Copenhagen with a pledge for serious carbon dioxide emissions cuts. CHARLES PAYNE, FOX BUSINESS NETWORK: Well, my next guest says the president's going to Copenhagen not in spite of these e-mails but because of these e-mails. He's in full panic mode. He's the author of the book "Red Hot Lies, How Global Warming Alarmists Use Threats, Fraud and Deception to Keep you Misinformed." So I guess based on the title, Chris Horner might feel a little vindicated by these hacked e-mails. How are you feeling about this thing? CHRISTOPHER HORNER, "RED HOT LIES" AUTHOR: Yes, the words I told you so have come to mind a lot in the last week, and I just want to be clear, I'm not saying you were intentionally misled by your previous guest. I agree he doesn't have enough understanding or knowledge of the issues to comment because, for example, beyond the e-mails in the actual computer code itself annotated in the double digit number of times we have statements like apply a very artificial correction decline, two exclamation marks, all caps, very artificial. And it's in the double digit number of times whereby they say they're applying an artificial decline to, as the gentleman said, use a trick to hide the decline. And I might be tempted to entertain such fantasy if not for an independent investigation. Thanks to Congress, already proving that these very specific actions and questions were a trick to hide the decline in temperatures. So they're trying to brazen this out, Charles, and the president, as you indicated, I believe, is doubling down. They're panicked. They're going to politically commit the U.S. in three weeks to a treaty now in violation of their own express policy of waiting for Congress to tell them what they're able to do because they really do believe they must act now. PAYNE: But the interesting thing though is even if they go over there, they make these proposals, you've got major countries out there, China and India, who seemed very reluctant to go along at all. Does that mean at the end of the day it's going to cost Americans even more money to comply with the president's agenda? HORNER: It's going to cost an awful lot of money. According to the Congressional Budget Office, EPA, Energy Information Administration, Charles River Associates International, American Council for Capital Formation, that's government, that's private, cap and trade kills jobs. It killed jobs in Europe. It sent them here. Carroll county, Kentucky. Steel jobs from Acerinox in Spain called North American Stainless Steel. Their CEO now says those jobs are going to Malaysia. I don't know what about that we don't understand, what about this newest export from Europe, we don't like. But cap and trade is energy rationing. It will kill jobs, it's the point. I have no reason to believe Barack Obama was lying when he said his goal was to cause energy prices to necessarily skyrocket to raise billions. This is an ideology in search of an excuse. The scientists in their own words have now affirmed, not revealed, affirmed. These are the same people I named in my book, admitting to precisely the actions I described in my book. Yes, I told you so has come to mind recently. PAYNE: So, Chris, now having said that, you know, listen, a lot of Americans still believe in global warming and are ready to take the dive, if you will. Is there any chance that these e-mails, this smoking gun can turn the tide? HORNER: Well, first of all, that's two different statements. A lot of people so long as it's at the cocktail, feel-good, don't you want to save the planet level? Yes, 80 percent of the people do. And then you say, what would you want to pay for it? And they say something below $1 per gallon and the "Washington Post" wouldn't ask below that. And I suggested less than a quarter a gallon because people understand - this, look, these people have been exposed in their own words as falsifying results. Not marginal results, the premise for Kyoto and cap and trade. It's an organized, in their own words, effort to destroy data, subvert and violate transparency laws, and it appears on its face to be an organized effort with an intent to defraud. Yes, we need an investigation because, Charles, these scientists say their names have been wrongly sullied. And there's no - they're great. And surely they join my call, Senator Inhofe's call and others for an investigation to clear their name before we go any further on these international commitments that really only target us and cap and trade, which is the biggest tax increase in American history. No, the American people don't support that, just ask them. PAYNE: All right. The biggest tax increase in American history. Chris, I know your phone's ringing off the hook, congratulations. Thanks for coming on the show. President Obama will almost certainly not travel to the Copenhagen climate change summit in December and may instead use his Nobel Peace Prize acceptance speech to set out US environmental goals, The Times has learnt. With healthcare reform clogging his domestic agenda and no prospect of a comprehensive climate treaty in Copenhagen, Mr Obama may disappoint campaigners and foreign leaders, including Gordon Brown and Ed Miliband, who have urged him to attend to boost the hopes of a breakthrough. The White House would not comment on Mr Obama's travel plans yesterday, but administration officials have said privately that "Oslo is plenty close" - a reference to the Nobel ceremony that falls on December 10, two days into the Copenhagen meeting. The White House confirmed that the President would be in Oslo to accept the prize, but a source close to the Administration said it was "hard to see the benefit" of his going to Copenhagen if there was no comprehensive deal for him to close or sign. Another expert, who did not want to be named, said he would be "really, really shocked" if Mr Obama went to Copenhagen, adding that European hopes about the power of his Administration to transform the climate change debate in a matter of months bore little relation to reality. At a hastily arranged breakfast on the sidelines of the Asia-Pacific Economic Cooperation summit meeting on Sunday morning, the leaders, including Lars Lokke Rasmussen, the prime minister of Denmark and the chairman of the climate conference, agreed that in order to salvage Copenhagen they would have to push a fully binding legal agreement down the road, possibly to a second summit meeting in Mexico City later on. Senate Democratic leaders said Tuesday they would put off debate on a big climate-change bill until spring, in a sign of weakening political will to tackle a long-term environmental issue at a time of high unemployment and economic uncertainty. Legislation on health care, overhauling financial markets and job creation will be considered before the Senate takes up a measure to cap emissions of carbon dioxide and other gases linked to climate change, Senate Democratic leaders said Tuesday. Climate legislation will be taken up "some time in the spring," Senate Majority Leader Harry Reid of Nevada said Tuesday after a Democratic caucus meeting. E-mail messages between high-ranking scientists appear to indicate a conspiracy by some of the world's leading global warming alarmists to falsify temperature data in order to exaggerate global averages. Barack Obama has thrown his weight behind a deal on climate change by announcing he will attend the Copenhagen summit with a pledge for a 17 per cent cut in US emissions. The US president's pledge removes one of the final obstacles to a deal, as other developed countries have already announced their targets to cut emissions by 2020. Canada's prime minister is reversing his position and will attend a United Nations climate change conference in Copenhagen next month, Stephen Harper's spokesman said Thursday. Dimitri Soudas announced Harper decided to attend one day after U.S. President Barack Obama and Chinese Premier Wen Jiabao announced their attendance at the U.N. talks. Soudas said Harper's decision was based on the fact that now "a critical mass of world leaders will be attending." So, four weeks ago, for a variety of reasons, Obama was believed to be skipping the Copenhagen conference. World leaders then decided to postpone coming to any major agreements there, and Reid similarly postponed bringing cap-and-trade legislation to the floor of the Senate. Along comes ClimateGate, and Obama quickly announced that he's heading to Copenhagen with a fairly serious emissions cut pledge. Not likely, for the White House either realizes that the current momentum against cap-and-trade legislation needs to be halted quickly if it's ever going to get passed, or they felt they needed to divert attention on the subject of global warming away from the growing scandal. After all, as e-mail messages and documents obtained from the computers of Britain's Climate Research Unit continue to be analyzed, it seems likely that more revelations damaging to scientists involved as well as to the global warming myth are going to surface. As NewsBusters reported Wednesday, the American Thinker's Marc Sheppard has already uncovered source code in CRU documents clearly used to manipulate climate data. More such discoveries seem a metaphysical certitude. With calls out for CRU director Phil Jones to resign or be fired, such occurring while the Copenhagen conference produces absolutely nothing could be close to a death knell for the entire climate alarmism movement.